Pragmatics can be defined as the intentional use of language to interact with other people. Although this definition emphasizes language, the use of language for social ends involves much more, including the coordination of linguistic information with gestures, facial expression, eye gaze, and body posture; the use of information from the physical, social, and affective context of the talk to decide what to say, how to say it, and what another person's words mean; and the integration of the current talk with relevant information from past encounters with the other participants or from previous events and entities referred to in the current talk. Moreover, typical children engage in considerable intentional communication prior to language, relying on nonverbal behavior and situational support. Consequently, becoming pragmatically competent requires skills and knowledge beyond those entailed in the acquisition of the linguistic system, including memory skills, deep and well-organized knowledge about the social and physical worlds and about the communicative process itself, the ability to flexibly integrate multiple sources of information from different modalities, and the ability to plan and recognise goal-directed sequences of actions. In light of the multiple domains of knowledge and skill that underlie pragmatics, it is not surprising that Down syndrome, which is associated with disruptions in the development of skills in multiple behavioral domains, should also be associated with pragmatic problems. Nevertheless, the profile of pragmatic development in Down syndrome is characterised by areas of relative strength and weakness and changes with age, reflecting both the changes in the domains of competence supporting pragmatic behavior and the dynamic nature of the societal demands for communication on the individual. In this section, we summarise the state of our knowledge concerning the pragmatic profile of individuals with Down syndrome from the prelinguistic period into adulthood, pointing out connections with other dimensions of the syndrome's behavioral phenotype where possible. We also point out areas in which the empirical base is inadequate. Typically developing children begin to communicate intentionally at around the age of 9 months, some 2 to 3 months in advance of using their first words. In particular, typical toddlers use various combinations of eye gaze, gesture, and nonlinguistic vocalization to express intentions to other people. To make a request for an object, for example, the child might point to the object and then look anxiously back and forth from object to adult while vocalising in a "pleading" tone. Children with Down syndrome are delayed in the onset of such intentional communication. Thus, they make fewer requests, particularly instrumental requests, which are designed to regulate another's behavior, than do developmental level-matched typically developing peers[7-10] or even cognitively matched individuals with intellectual disabilities of other aetiologies. Although less delayed than in requesting, children with Down syndrome are also delayed relative to developmental level-matched typical children in the frequency and maturity of form of their comments (i.e., attempts to direct a partner's attention to something interesting in the environment[12,13]. In order to engage in intentional acts of communication, such as requesting and commenting, a number of interrelated prerequisite achievements and behaviors must be in place, each of which poses its own set of challenges for children with Down syndrome. For example, the child must be able to engage in joint attention, which entails the coordination of one's attention with that of a partner, as when a child tries to direct an adult's gaze to an object of interest or when the child looks toward an object to which the adult is already attending. Infants with Down syndrome are delayed relative to age, although not developmental level, expectations in mastering the various components of joint attention[10,15,16]. Intentional communication also requires the ability to use a variety of gestures, including pointing. Although delayed relative to their typical age peers, gesture use appears to be an area of relative strength of children with Down syndrome. In fact, research has shown that children with Down syndrome use gestures more often, and have a larger repertoire of different gestures, than do their developmental level-matched typical peers. It may be that difficulty acquiring spoken language fuels an increased reliance on, and enhanced development, of gestures. Cognitive achievements are also necessary for progress in the domain of prelinguistic intentional communication. The acquisition of concepts about objects and about the causal connections between actions and outcomes have been found to be related to progress in commenting and requesting for children with intellectual disabilities, including those with Down syndrome[8,12,13,18], as well as for typically developing children. Whatever their source, the delays in prelinguistic intentional communication displayed by children with Down syndrome may play a causal role in their subsequent delays in linguistic communication. In particular, longitudinal studies have demonstrated that higher rates of nonverbal commenting and of nonverbal requesting are associated with better outcomes among children with Down syndrome[9,19]. As discussed in the previous section, there is evidence of pragmatic problems for children with Down syndrome during the prelinguistic period. These problems continue in the linguistic period, although some facets of pragmatics are more challenging for individuals with Down syndrome than are other facets. It has been found that children with Down syndrome express the same intentions through language, and at the same relative rates, as do younger, typically developing children at similar developmental levels, at least when interacting with parents or other competent adults [20,21]. 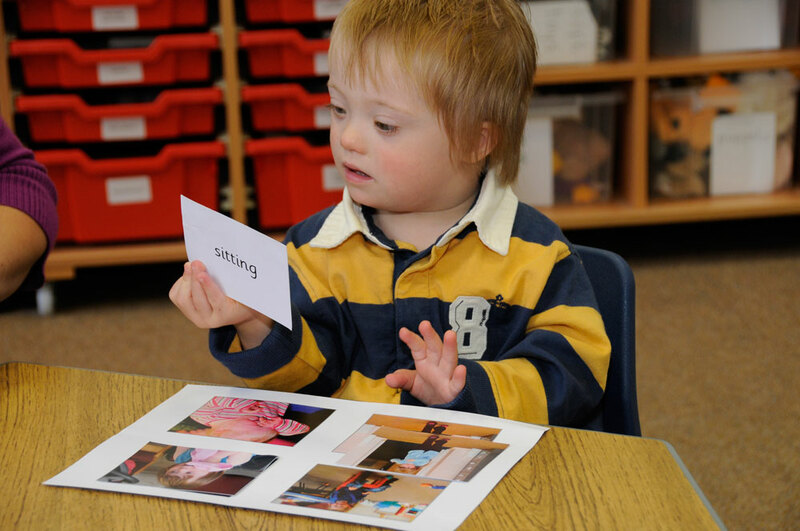 The most common intention expressed by preschoolers with Down syndrome, is "answering" (e.g., answering a yes-no question), which reflects their passivity in conversation with adults. These results suggest that once they begin speaking, children with Down syndrome view language as a vehicle for expressing the same types of social intentions as do typically developing children at similar developmental levels. Although individuals with Down syndrome may have a reasonable understanding of how language can be used in social interaction, they display areas of substantial pragmatic weakness, particularly as they grow older and face contexts in which information must be conveyed about increasingly abstract or absent entities and events. In a study of non-face-to-face talk, Abbeduto and his colleagues found that adolescents and young adults with Down syndrome were more likely than nonverbal mental age-matched typically developing children to extend the same description to two or more intended referents, rendering the description uninformative from the listener's perspective. The adolescents and young adults with Down syndrome were also less likely than their typically developing matches to include "scaffolding" in their descriptions (e.g., "it looks kind of like a …) to assist the listener. It is important to note that although performance in the non-face-to-face task was correlated with a measure of expressive language ability (i.e., vocabulary and syntax), the pragmatic difficulties of the speakers with Down syndrome also reflected their limited understanding of basic principles of informational adequacy in linguistic interaction. Although there are areas of pragmatics in which individuals with Down syndrome have especially serious impairments, there are other areas in which they display strength compared to individuals with other neurodevelopmental disorders. As a group, children with Down syndrome, for example, seldom engage in verbal perseveration (e.g., an unusual number of utterances on the same topic) or produce off-topic or tangential language compared to developmental level-matched children with fragile X syndrome[23-26]. Moreover, individuals with Down syndrome seldom use stereotyped language or begin conversations inappropriately compared to individuals with Williams syndrome. Narrative, or story-telling, is a particularly important type of linguistic interaction, with rules and organisational principles different from those of everyday conversation. Mastery of the narrative form is predictive of subsequent success in school and helps to organize and facilitate the acquisition of knowledge of the social world. At the same time, however, narrative can require more sophisticated language use, especially syntax, than does much of every day conversation. Individuals with Down syndrome appear to recognise and express the important elements of a story despite their limited lexical and syntactic skills[30,31]. They do so, however, by expressing that content in a larger number of simpler syntactic forms than do their typically developing peers. In fact, the syntactic limitations of individuals with Down syndrome are even more apparent in narrative tasks than in conversation. Thus, these findings suggest that individuals with Down syndrome are able to compensate somewhat for their expressive syntax problems to convey narrative content. And finally, Chapman and colleagues have demonstrated that the narrative skills of individuals with Down syndrome can be increased, at least as regards narrative content, by focused questioning and visually supported practice[31,32,34]. Although work on pragmatic development in individuals with Down syndrome began in earnest in the mid 1970s, many questions remain. First, we know little about the ways in which the profile of pragmatic strengths and weaknesses is shaped by other aspects of the Down syndrome behavioral phenotype. It is likely that the speech and language impairments limit the 'tools' available for communication and lead to the adoption of atypical strategies for communication. It is also likely that pragmatic impairments negatively affect subsequent linguistic achievements. How these bidirectional processes unfold is largely unknown. Second, there is considerable evidence that individuals with Down syndrome elicit unique types of social and affective responses from other people; however, it is not clear how these shape pragmatic development. Third, we still know very little about how the profile of pragmatic development in Down syndrome differs from that of many other neurodevelopmental disorders. Finally, there have been surprisingly few attempts to treat the pragmatic problems of individuals with Down syndrome, especially through interventions tailored specifically for that population. Recent prelinguistic interventions[19,35], however, are promising. Levinson SC. Pragmatics. Cambridge: Cambridge University Press; 1983. p.420. Clark HH. Using Language. New York: Cambridge University Press;1996. Bates E. Language and context. New York: Academic Press;1976. Abbeduto L, Keller-Bell Y. Pragmatic development and communication training. In Buckley S, Rondal J, editors. Language intervention in Down syndrome. London: Whurr Publishers; 2003:p.98-115. Abbeduto L, Warren SF, Conners FA. Language development in Down syndrome: From the prelinguistic period to the acquisition of literacy. Mental Retardation and Developmental Disabilities Research Reviews. In press. Bates E , Benigni L, Bretherton I, Camioni L, Volterra V. The emergence of symbols: Cognition and communication in infancy. New York: Academic Press;1979. Beeghly M, Weiss-Perry B, Cicchetti D. Beyond sensorimotor functioning: Early communicative and play development of children with Down syndrome. In: Cicchetti D, Beeghly M, editors. Children with Down syndrome: A developmental perspective. New York: Cambridge University Press;1990. Fidler DJ, Philofsky A, Hepburn SL, Rogers SJ. Nonverbal requesting and problem solving. American Journal of Mental Retardation. 2005;110:312-322. Mundy P, Kasari C, Sigman M, Ruskin E. Nonverbal communication and early language acquisition in children with Down syndrome and in normally developing children. Journal of Speech, Language, and Hearing Research. 1995; 38:157-167. Sigman M, Ruskin E. Continuity and change in social competence of children with autism, Down syndrome, and developmental delays. Monographs of the Society for Research in Child Development. 1999. 64(1). Mundy P, Sigman M, Kasari C, Yirmiya N. Nonverbal communication skills in Down syndrome children. Child Development. 1988; 59:235-249. Greenwald C, Leonard L. Communicative and sensorimotor development of Down's syndrome children. American Journal of Mental Deficiency. 1979;84:296-303. Smith L, von Tetzchner S. Communicative, sensorimotor, and language skills of young children with Down syndrome. American Journal on Mental Deficiency. 1986;91:57-66. Adamson L, Chance S. Coordinating attention to people, objects, and language. In: Wetherby S, Warren S, Reichle J, editors. Transitions in prelinguistic communication. Baltimore: Brookes; 1998:p.15-39. Berger J. Interactions between parents and their infants with Down syndrome. In: Cicchetti D, Beeghly M, editors. Children with Down syndrome: A developmental perspective. New York: Cambridge University Press; 1990. p 101-146. Berger J, Cunningham C. The development of early vocal behaviors and interactions in Down syndrome and non-handicapped infant-mother pairs. Developmental Psychology; 1983;19:322-331. Franco F, Wishart JG. Use of pointing and other gestures by young children with Down syndrome. American Journal of Mental Retardation. 1995;100:160-182. Mundy P, Seibert JM, Hogan AE. Relationship between sensorimotor and early communication abilities in developmentally delayed children. Merrill-Palmer Quarterly. 1984;30:33-48. Yoder P, Warren S. Early predictors of language in children with and without Down syndrome. American Journal of Mental Retardation. 2004;109:285-300. Coggins TE, Carpenter RL, Owings NO. Examining early intentional communication in Down's syndrome and nonretarded children. British Journal of Disorders of Communication. 1983;18:99-107. Owens RE Jr., MacDonald JD. Communicative uses of the early speech on non-delayed and Down syndrome children. American Journal of Mental Deficiency. 1982;86:503-510. Abbeduto L, Murphy M, Cawthon S, Richmond E, Amman A, Beth P, Weissman M, Kim J, Cawthon S, Karadottir S. Collaboration in referential communication: comparison of youth with Down syndrome or fragile X syndrome. American Journal of Mental Retardation. 2006;111(3):170-183. Belser RC, Sudhalter V. Conversational characteristics of children with fragile X syndrome: repetitive speech. American Journal on Mental Retardation. 2001;106(1):28-38. Ferrier L, Bashir A, Meryash D, Johnston J, Wolff P. Conversational skills of individuals with fragile-X syndrome: A comparison with autism and Down syndrome. Developmental Medicine and Child Neurology. 1991;33(9):776-788. Roberts J, Martin G, Moskowitz L, Harris A, Foreman J, Nelson L. Discourse skills of boys with fragile X syndrome in comparison to boys with Down syndrome. Journal of Speech, Language, and Hearing Research. 2007;50:475-492. Sudhalter V, Cohen IL, Silverman W, Wolf-Schein E. Conversational analyses of males with fragile X, Down syndrome, and autism: Comparison of the emergence of deviant language. American Journal of Mental Retardation. 1990;94(4):431-441. Laws G, Bishop DV. Verbal deficits in Down's syndrome and specific language impairment: a comparison. International Journal of Language and Communication Disorders. 2004;39(4):423-451. Ninio A, Snow CE. Pragmatic development. Boulder, CO: Westview Press;1996. Abbeduto L, Benson G, Short K, Dolish J. Effects of sampling context on the expressive language of children and adolescents with mental retardation. Mental Retardation. 1995;33,279-288. Boudreau D, Chapman R. The relationship between event representation and linguistic skill in narratives of children and adolescents with DS. Journal of Speech Language and Hearing Research. 2000;43:1146-1159. Miles S, Chapman R. Narrative content as described by individuals with DS and typically-developing children. Journal of Speech, Language and Hearing Research. 2002;45:175-189. Miles S, Chapman R, Sindberg H. A microgenetic study of storytelling by adolescents with DS and typically-developing children matched for syntax comprehension. Poster presented at the Symposium for Research on Child Language Disorders, Madison, WI, June; 2004. Abbeduto L, McDuffie A. Language learning and use as embedded social activities: Evidence from autism and fragile X syndrome. In: Paul R, editor. Language Disorders from a Developmental Perspective: Essays in Honor of R.S. Chapman. Mahwah, NJ: Lawrence Erlbaum; 2007. Miles S, Sindberg H, Bridge C, Chapman R. Scaffolded expression of setting information in narratives by adolescents and young adults with Down syndrome. Poster presented at the joint Symposium for Research on Child Language Disorders and International Association for the Study of Child Language. Madison, WI;July 2002. Girolametto L. Improving the social-conversational skills of developmentally delayed children: An intervention study. Journal of Speech and Hearing Disorders. 1988;53:156-167. Leonard Abbeduto is at the Waisman Center, University of Wisconsin-Madison, Madison, WI, U.S.A.